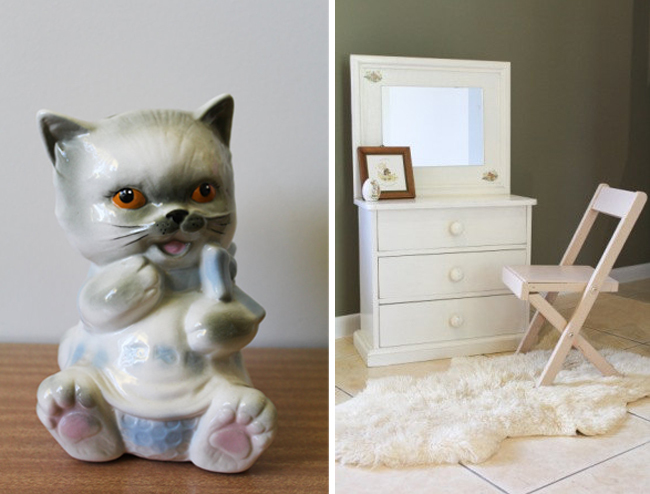 Trudi runs the adorable blog and business My Vintage Childhood. 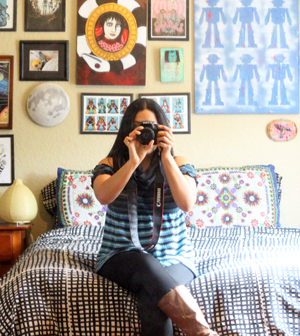 She balances selling high quality vintage wares and being a full-time caretaker to three children, a chihuahua and three birds! I had a hard enough time running my business with just a cat and myself to take care of! She's doing such a good job, I just had to "sit" with Trudi and ask some questions about work-life balance and business success. 1. Please tell us a little about yourself, Trudi! I'm an enthusiastic vintage loving, living, wearing mum to three children, I'm the the looker-afterer of said children and a chihuahua and three budgies, with my husband. I constantly have hair brained ideas churning away and have an artistic and creative soul always looking to get my hands busy with something. I love rock 'n' roll, eating jam and cheese sandwiches and chasing happiness wherever life takes me. 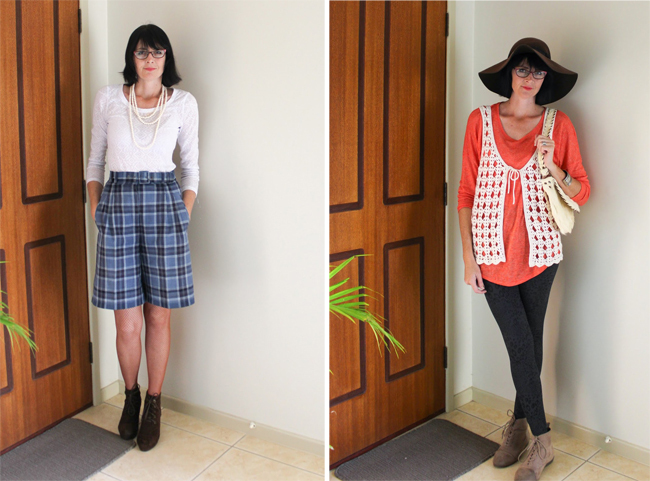 Trudi showcasing her cute thrifted outfits. 2. Please tell us a little bit about your business. I think my business name says it all My Vintage Childhood, it's all about genuine vintage, retro, antique and kitsch delights from clothing, toys, books, nursery items, wall hangings and decor for children. But it's not just for kids, it's also for all those grown up vintage loving hearts out there still collecting and trying to capture childhood memories in childhood delights. 3. When did you start collecting vintage? It's always been a thing since I was a child and has increased with intensity into adulthood. As a kid I often tried to rescue little old trinkets and small items from certain deaths because they were seen as "old" in others eyes. 4. When and why did you start your reselling business? 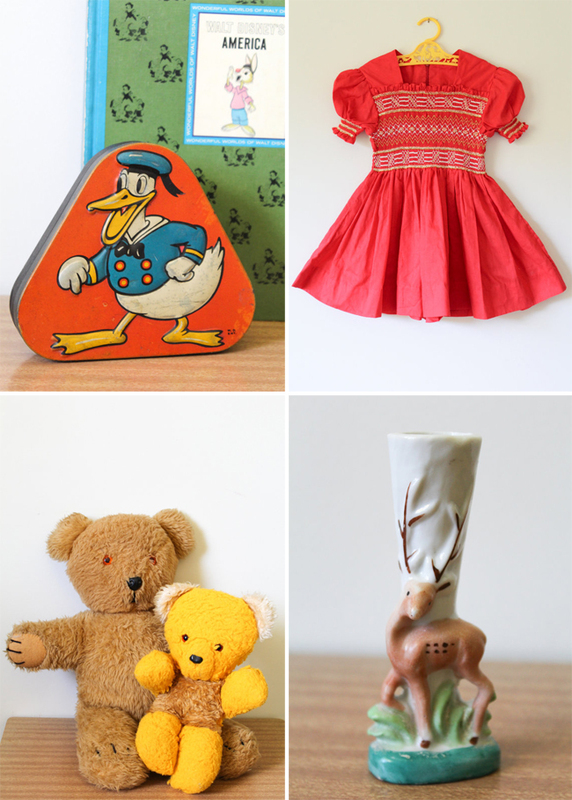 In my early twenties I started collecting vintage baby and children's clothing, thinking that when I had children they'd be dressed constantly in vintage. But continually over time I'd keep amassing so much that my storage space at home was overflowing. So I'd sell pieces to friends, then after a while that lead me to selling on eBay, doing markets and in more recent years vintage fairs, shop displays and my Etsy store. 5. How do you balance your business responsibilities and being a mom? Family is always first and I work in pockets of time around my family, I also have two days a week where all three kids are in care or at school. On child free days business and blog are the priority. Bigger jobs are tackled on my free days and smaller jobs are managed in smaller pockets of time around the family like when the kids are in bed at night or nap time. 6. Can you tell us a bit about what your daily routine is like? I wake up very early but so do my kids generally, so before they are awake I've usually already checked social media and emails and responded to anything urgent. Once everyone is awake it's all about the kids and getting ready for the day. Then it's straight into school run, then off to the post office if there are sales to be shipped. If my two younger children are home, the rest of the day has to be flexible around them and their needs. But I will attend to any of the following: stock cleaning, repairs, photo editing, draft listings. All of these things are jobs I can step away from easily if they need me and are home. 7. What are your tips to a beginner indie business owner? Just start is my number one tip, don't talk yourself out of your ideas, give them space to float. Second to starting, I would highly recommend budding up with someone who you click with in your niche or just outside of your niche, someone that can be a bit of a mentor to you who is ahead of you in the journey, I have found it utterly essential. 8. I definitely agree on giving ideas space to float, and having mentors/friends and not being completely alone when you start is so helpful. What are your tips to fellow moms who want to start a work-at-home biz? Similar to above, I want to say to mums: just start. You deserve to have your "thing" going on!!! Realise [sic] and expect that a business is much like a developing child they go through growth spurts and learning curves. You'll go through the same with an at home business. Set yourself up for success and have elements to your business workload that are flexible that can be easily changed around the ever changing needs of your children and family. 9. How about any vintage hunting tips? Don't listen to those who say the vintage is running out because everyone is looking for it now days. It can be found everywhere but you have to get smart about where you're looking, thrift shops, yard sales and deceased estates are good standards. But don't under estimate advertising an "in search of" ad of things you are often buying or searching for. It can be a great way to be contacted about items and collections before they see the light of day by anyone else. 10. What's a favorite thrifted find? That's like asking me to choose which of my three children is my favourite [sic]. I'd rather tell you that except for our bed and the children's beds our home is furnished from thrifted finds from thrift stores, yard sales, church sales, auctions, eBay and hand me downs from family and friends. As a result we have a home as we continue to work towards making it just so, that friends and visitors always say is an inviting, relaxed home full of love and quirk. Friends frequently doze off and have a little nap in a corner of our place, I think that's compliment enough and that's why our furnishings are my favourite. 11. What do you like the most about being a soloprenuer? I like being able to indulge my passion, interests and ideas and let them run free without the restriction of an employer putting requirements upon it. But more than anything I like that I'm able to show my children that living your passion and following your dreams and deepest creative yearnings is possible with persistence. Thanks for sharing your business and family balancing expertise with us, Trudi! 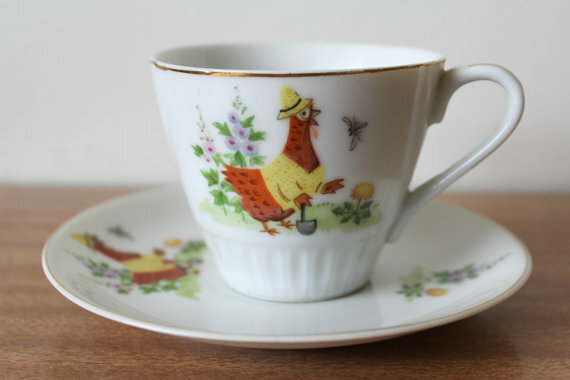 Trudi finds some wonderful things, I think I would have serious problems putting them up for selling and letting go of them once they've sold! He he he I often have a serious inner conflict with some of the pieces I find. You get used to it as a reseller. In my case I wanted everything, even cherished favs, to sell after a while. I only regret if they didn't sell for enough. "Don't talk yourself out of ideas". Great advice and great interview! Thanks for the inspiration. Yeh, that's one that's hard for me, too. I talk myself out of ideas all the time.